At no time is the arrangement of the hair so noticeable as in the summer, when the average healthy American girl goes hatless. At about sixteen or seventeen years the hair is generally worn up on the head, and if the present modes are followed, and the hair arranged deep over the brow and ears and low in the back, the youthful grace and charm will not be sacrificed. Girls of fourteen and fifteen may wear their hair parted in the center or on either side, or combed back in a soft pompadour with the ends of the hair fastened with a barrette as shown below. For straight hair the plaited mode at the bottom of this page is very pretty. A flat bow is suitable for daywear, or a satin band for parties. 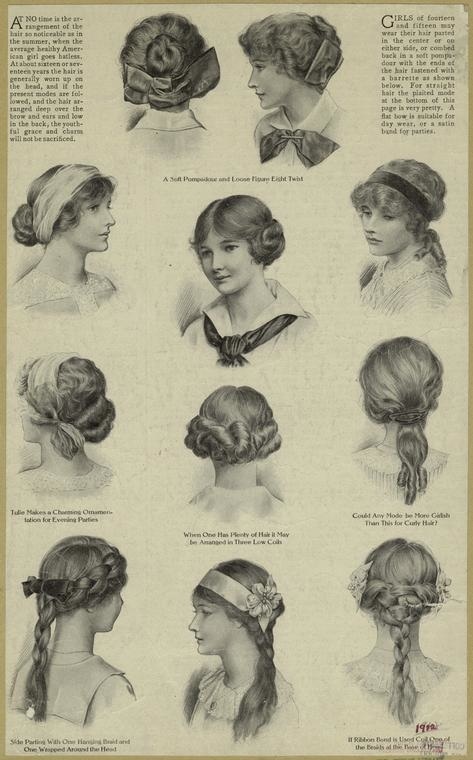 It seems, from your photos and elsewhere, that hairdos for Edwardian girls were far softer and less of an engineering feat than their mothers endured in the Victorian era. Victorian ringlets, loops and crimping, presumably done by maids, must have been uncomfortable and time consuming. Your young ladies look natural and lovely. Yes, they are loose and lovely–suitable for active young girls who do more than home handicrafts and write letters. Gorgeous! By any chance do you have the names of the hairstyles? I tried to zoom in but I couldn’t read them. I’ve heard of Braids a la Didon, pompadours of course, and i’d love to learn some other terms. A Soft Pompadour and Loose [unintelligible] Eight Twist. Tulle Makes a Charming Ornamentation for Evening Parties. When One Has Plenty of Hair it May be Arranged in Three Low Coils. Could Any Mode be More Girlish Than This for Curly Hair? Side Parting With One Hanging Braid and One Wrapped Around the Head. If Ribbon Bond is Used Coil Around the Braids of the Round of Head. That’s perfect, Evangeline. Thank you so very much! I love these hairstyles! They are all very pretty! I’ll try to dig some up for you! This is great! An associate shared this with me this morning on Facebook. Impressive.